Built at a cost of around £20,000 it is made of wrought iron and spanned on the south side one hundred and twenty five feet. 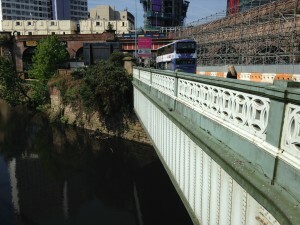 Connecting the upper end of Chapel Street with what was in the late 19th century, the bustling Exchange Station and Hunt’s Bank ( now Victoria Station), the bridge was opened in 1864, built on land donated by Samuel Brooks, who stipulated that a stout wall, one hundred and fifty feet in length be built on the Salford side. Just downstream stands Victoria Bridge, near to the site of the original Salford Bridge, first mentioned in 1368 where Thomas De Both built his first chapel on the boundary between the two towns, the chapel later being converted to a prison and the bridge, consisting of three stone arches, being being one of the first battles of the civil war and the scene of the siege of Manchester.It was knocked down in the 1830’s and replaced by the Victoria Bridge, named after the new Queen. the catalyst to £400 million of private sector investment, which will see over 100,000 square metres of commercial floorspace and 1,100 residential units created and a potential 5,000 new jobs in the area”. 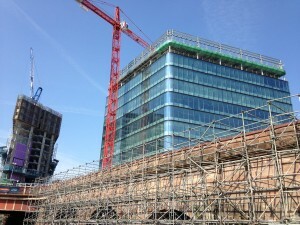 Across the bridge, work is currently taking place on the construction of two modern steel and glass buildings, also part of the Greengate embankment programme. Due to be completed in late 2016, the site will offer 165,000 square feet of prime office space along with 442 parking spaces, the glass offices offering 360 degree views of the city. 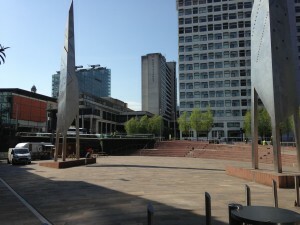 This was once the heart of medieval Salford, the site of the Salford Cross and the notorious Greengate area, more recently it was a bus station. 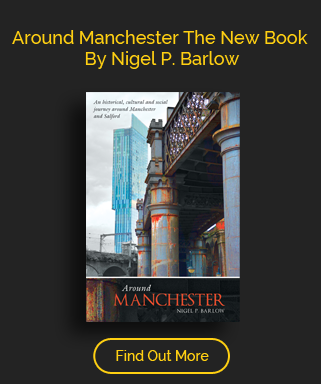 Salford’s Greengate was once an expanse of land eighty yards long and thirty yards wide, and beyond it a hedge bordered ane which led down the river to a ford which crossed to Broughton by the end of the Victorian era, it contained all of nineteenth century Salford in a microcosm. On the corner of Blackfriar’s Road and Chapel Street stands the Black Lion Pub, birthplace of the Showmen’s Guild in 1889, which upheld the rights of travelling fairground workers. In the 20th century George Orwell and George Best would be regulars. 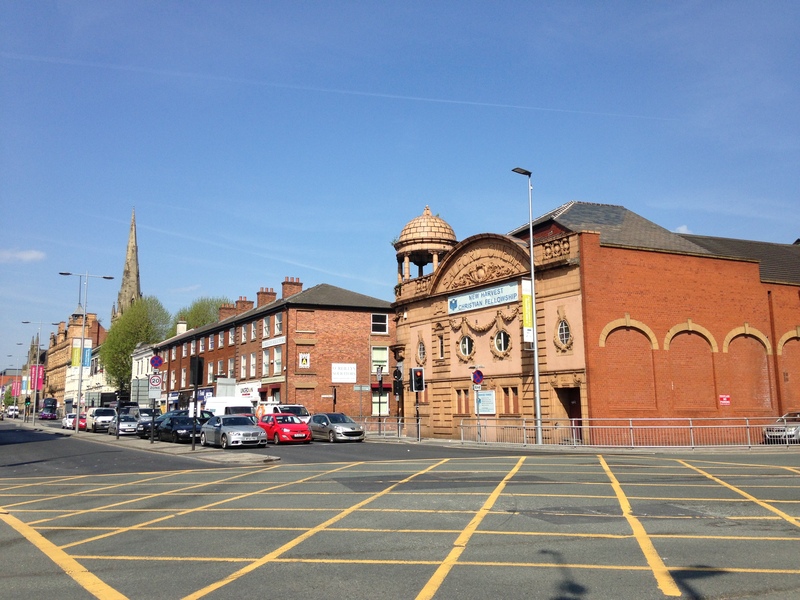 Chapel Street’s Sacred Trinity Church is the oldest in Salford, founded by Humphrey Booth in 1635, although the building that you see today dates from around a century later. 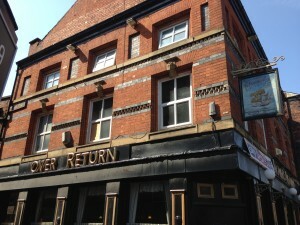 Once Chapel Street was a haven for the connoisseurs of pub crawls but as with much of the country in the 21st century, many have long since closed.The Rover’s Return surrounded by regeneration survives for the moment. 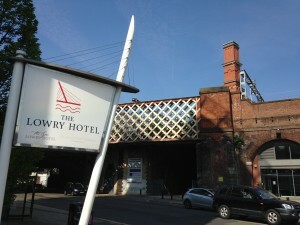 The Five Star Lowry hotel opened in 2001, owned by Sir Rocco Forte until 2014, the hotel, which regularly attracts sporting and show business guests, stands on Chapel Wharf, close to where DC Thomson, the printers once stood and has been at the centre of its redevelopment facing the River Irwell. 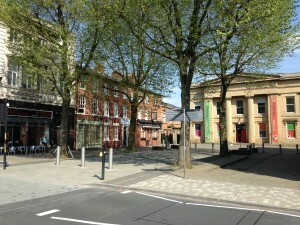 The building housing the original Salford Town Hall stands at the end of the Square. 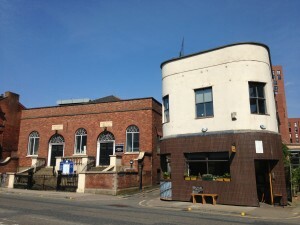 The Grade II listed building was erected in the 1820’s, the first by the architect Richard Lane, latterly used as a Magistrates Court, it is currently being turned into luxury apartments. 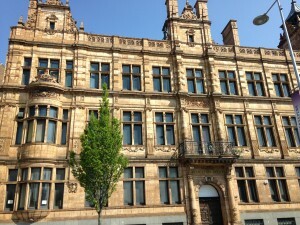 Further along stands the impressive building that once housed Salford’s Education Board Offices. 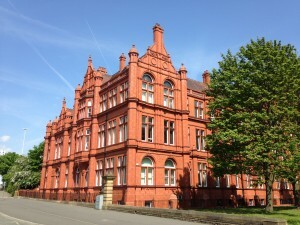 These were built in 1895 and were in use by the council until 2001, latterly as the council’s education Directorate Headquarters. 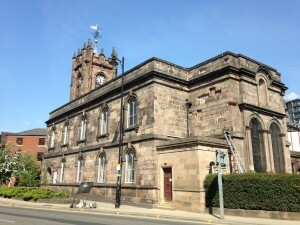 Today the building is home to new offices, lecture and seminar rooms, a bookshop, archive/museum accommodation, and residential accommodation for the Diocese of Salford Cathedral ideal for this purpose, located, as they were, adjacent to Cathedral House and the Cathedral itself. 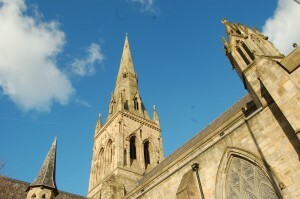 Salford’s Catholic Cathedral, St John the Evangelist, was founded in 1844 financed mainly by two wealthy Catholic textile merchants,The Leeming family and the family of Daniel Lee. Ten Sundays schools of Manchester and three from Salford marched in procession to the site on its foundation day, with bands playing and banners waving on Whit Sunday. Some six thousand took part, and the foundation stone of St. John’s was laid and blessed by Dr. Sharpies, Bishop Coadjutor to Dr. Brown of Liverpool. The Cathedral’s stained glass window designed by William Wailes depicts the history of the Catholic Church in England. 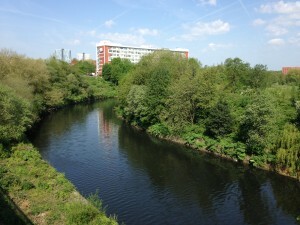 The origins of Vimto lie across the Irwell in Granby Row, production of the tonic formulated by John Noel Nichols, would move to Chapel Street in 1910 as demand for the product rapidly grew.Later production would move to Ayres Road in Old Trafford; factories in Wythenshawe and Golborne, near Haydock before finally handing over the manufacturing side to an outside company. 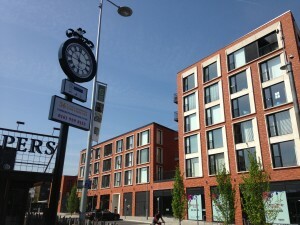 The site is now home to TimeKee per’s Square, also known as Vimto Gardens part of the regeneration of Chapel Street, a new development of apartment’s, town houses, a courtyard and retail and commercial space. 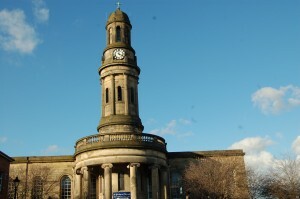 St Philip’s Church is unique in Salford. Designed by Sir Robert Smirke in 1825, the view of its Greek style is the most impressive, with its bow, fronted porch with ionic colonnade and balustrade parapet and bell tower above, it was one of many built across the country financed by a million pound grant given by Parliament to offer thanksgiving for the victory at the at the Battle of Waterloo. The Salford Royal Hospital dates from 1827, originally the Salford and Pendleton Dispensary, it began to take in patients in the 1840’s, new wings were added in 1865 and it was renamed the Salford Royal.Further expansion took place in the 1880’s and just before the First World War which doubled its capacity from 119 to 209 patients. Increasingly used as a training centre for nurses with the expansion of Hope Hospital, it was at the centre of tragedy during World War Two, the nurses home was destroyed by an air raid, killing fourteen nurses and trainees. 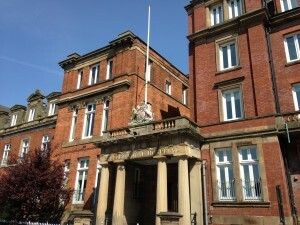 With the birth of the NHS in 1948, the Salford Royal Hospital ceased to be a voluntary hospital and became part of the Salford Hospitals Group. 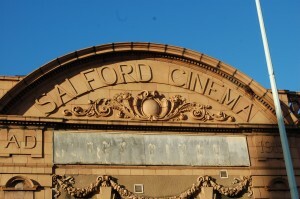 The Hospital closed in 1993 when Hope Hospital enlarged and became the Salford Royal Hospital Trust. 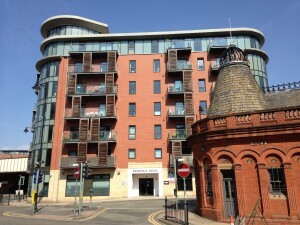 Today, some of the smart Georgian Houses remain as does the view across the River Irwell, the area is steeped in history. 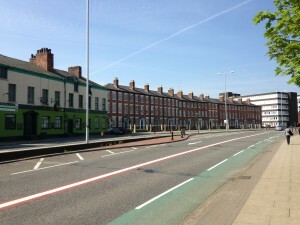 The Crescent Pub, originally the Red Dragon, was the favourite hostelry of Marx and Engels, the scientist J.P Joule lived here, while the opening of Peel Park and its museum and library plays an important part in modern social history.